How far would you go to have fun? One of US's most popular female artistes with a powerful voice, together with one of Ireland's most popular boy groups have sailed into the No: 1 position on the UK singles chart this week. The US female artiste is Mariah Carey and the Irish group is Westlife. They have joined forces to cover the old Phil Collins hit of 1984 'Against All Odds'. For Mariah Carey it's her 14th visit to the No: 1 spot in the UK. Her last chart topper in the Isle was 'My All' in May 1998. Since then her releases have only made brief visits to the Top 20. Teaming up with Westlife was indeed a very good move because the boy group is very popular both in the UK and Ireland. They came into the scene in April 1999 and already scored 6 No: 1 songs in the UK. Those chart toppers for Westlife have been 'Swear It Again', 'If I Let You Go', 'Flying Without Wings', 'I Have A Dream/Seasons In The Sun', 'Fool Again' and the current hit 'Against All Odds' which is of course a duet with Mariah Carey. Fans of both Mariah Carey and Westlife, teenagers and other youngsters who have only heard the new version of 'Against All Odds' will perhaps rave over the song. Mariah uses her voice to full capacity while Westlife as a group is exposed with a powerless output. Phil Collins rendition was tremendous back in 1984. It peaked in the chart at No: 2 when things were much more difficult. Collins was also criticized at the time as many people out there believed and still maintain that he is an ordinary vocalist. The original Collins version was also featured on the soundtrack of the movie called "Against All Odds". Billie Piper also returned to the UK singles chart four months after her last single 'Day & Night' reached the top of the chart. This week Billie's entry 'Something Deep Inside' managed to check in at No: 4. The song is very much like a Britney Spears track which could have led to some confusion in the minds of the market. Even in the video clip Billie takes on a new look, a slim version of Mariah Carey. The 17-year- old star now has 3 No: 1 songs and two albums to her credit. Teenage pop star Britney Spears was appointed agony aunt for the BBC's on line service. Another piece of news that was flashed on September 23 by the tabloid The Daily Star, referred to Britney playing strip poker with a rather famous screen star. It was opening night, the lights were about to flare and the players about to take the stage -Anamika's stage. She was the enigmatic character who captured the hearts and imagination of eight young playwrights. Armed with pen and ink, they set about the godly task of giving her life. She was the centre of attention, an artist's inspiration, an author's heroine, but on show night - she never showed up. If you took the time to see 'The Absentee' - presented by the students of Methodist College - you'd know what I'm talking about. It was a radical dramatic experiment to say the least. Ruwanthie de Chickera, the play's director, having given them the task of describing 'Anamika' the nameless girl without ever having her appear on stage, the eight MC'ites dived in with all guns blazing. "When we started, Ruwanthie said write it like a poem, a part of a diary, a recipe, it could be anything." They added with a laugh, " we came up with some really weird stuff." A number of good creative pieces came out of this exercise though not all of them were used for the final production. 14 short scenes were selected and intensely worked on by the whole crew of director, writers and cast to come up with a very intense and interesting string of dramatic flashes. Rukshani Weerasooriya's masterpiece was a soliloquy, which intermittently popped up throughout the play. Each time it appeared, the very same monologue was presented in contrasting ways by a character who seemed to be the elusive Anamika. "I wanted Anamika to be someone different," said Rukshani. She certainly managed to do that with some very intense and thought provoking ideas, which she gave her character...characters. "The play was about judgements," said Ruwanthie " and the soliloquy summed it up by taking the same piece and presenting it in six different ways. Each time the judgement of the character was different." The final twist came when the soliloquy turned out to be an audition for a play, "the concept being a play within a play," said Rukshani. 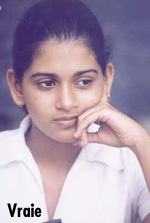 Dinithi Abeysinghe conjured up the 'computer hackers'. An unlikely posse of three "jobless" individuals who seem to have an affinity towards 'funky' attire and dominating the world. They conspire to cook up a computer virus with which they would hold the world to ransom." You don't get it until it is said 'Anamika is the virus'," says Dinithi with a smile, "then you go... ahh she's unstoppable, you don't know where she's coming from, you can't identify her." An interesting concept spiced up with ticklers from start to finish, it was techno chaos and a lot of fun. The theme music faded and the panel sat down, unfolding a talk show. The brain child of Chathurika Gammampila, this scene focused on the rather delicate social dynamics of university. "The issue of ragging is something I feel strongly about," says Chathurika explaining her motive for writing the 'talk show' which portrayed Anamika as someone victimised for her individuality. The characters were remarkably authentic with witty humour cleverly woven into the plot which kept the audience quite engrossed and rippling with laughter. "It was supposed to be quite serious," grinned Chathurika, "but it turned out to be so hilarious, even I couldn't believe it!" 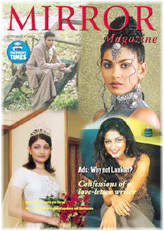 A newsroom was Dilhara Attygalle's scenario for depicting Anamika. The fast paced routine of a typical news desk is temporarily disrupted when a controverisial story is brought up. Here, Anamika is a student raped by her guru who is also a prominant public figure. "What I was trying to show is how certain controversial issues get covered up just because they involve high profile people," said Dilhara. She also wrote a scene about an old couple whose daughter was Anamika. Emotionally charged, this scene probed and portrayed some delicate recesses of human nature. Siroshni Illangage's approach was also a play within a play, but not quite. Her presentation of Anamika was through two writers who were also writing a play about a girl named Anamika. They discuss their character and conclude that she should be someone who brings happiness and new meaning to the lives of elderly people. "What I wanted to put across was how the elderly get pushed out of society," said Siroshni. The stage was empty in Vraie Balthazaar's rendition. The scenario was of messages left on Anamika's answering machine. This was a great idea excellently done, just using sound. "This was the only scene where we started off with one idea and stuck to it right throughout," said Vraie. Sandamali Wijeratne was the architect of three scenes, all of them contrasting in style and theme. The 'florist' and the 'painter' were hilarious comedies which sent the audience into fits with some extremely interesting characters and witty puns. Sandamali used the 'school speech' scene to focus on "how people view teenage pregnancies." Anamika was of course the controversial teenager concerned. It was a deft approach to a touchy subject. Tara Kumarasinghe, a playwright in the making, masterminded four excellent bursts of theatre. Using some great dialogue and attention grabbing devices, Tara's depiction of the elusive Anamika in all four of her scenes, was...good stuff. Her enthusiastic statement: "I would definitely do this sort of thing again," makes it obvious that Tara thoroughly enjoyed her work. "It was hard," they all said empahtically about writing this rather radical play. As they say, hard work pays rich dividends and this was proven beyond a shadow of a doubt on show night. Excellent scripts combined with classy acting made 'The Absentee' very memorable indeed. Asked how they all felt about having written and produced a successful play, they all chorused, "it feels great!"